1. Inhalation, such as pollen, smoke, chemicals, dust, etc. 2. Ingestion, such as foods, medicines and supplements. 3. Contact with the skin, such as chemicals, perfumes, creams, latex, plants, etc. 4. Inoculation on the skin, such as insect bites. What causes the allergic reaction is not the direct and active action of the allergen, but the exaggerated response of the organism to the contact with the allergen. This explains why some people have allergies to certain particles and others do not. Pollen, for example, may be allergenic to some and harmless to others. Rhinitis is inflammation of the mucous membranes of the nasal cavity, usually caused by a viral infection or an allergic reaction. In this text we will stick to allergic rhinitis. In the next two paragraphs I will use a little more technical terms to explain the inflammatory mechanism of allergic rhinitis, but do not be alarmed, I will try to use analogies and be as docile as possible. The following information will be important in understanding how some of the treatments work. Allergic rhinitis arises when an allergic person inhales some particle that stimulates your immune system. 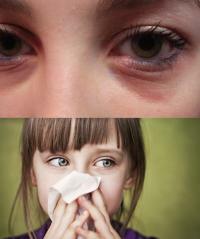 As a child, we come in contact with several potential allergens without having major problems. Allergic people are those who come into contact with certain particles to produce antibodies against them, as if they were harmful invaders, virus type, bacteria, etc. Let's use pollen as an example. People allergic to pollen are those who, when entering contact with this allergen for the first time, produce in large quantity an antibody called IgE. From this moment, the nasal mucosa begins to be populated with a cell of the immune system called mastócito, that has several antibodies IgE in its surface. It is as if the body thought that the pollen was a burglar and started to fill the nasal cavity of highly armed (mast cells) (IgE). As soon as this person comes in contact with the pollen, IgE antibodies rapidly capture it, activating the mast cells, which release several chemical mediators to destroy the invader, the most important of which is histamine, responsible for the main symptoms of rhinitis that will be explained more forward. The allergic symptoms of allergic rhinitis are, therefore, a side effect of the chemical warfare that the immune system blocks against some particles. Pollen itself does not cause any harm, but the immune system of the allergic does not think so. Non-allergic people are those who come in contact with pollen, for example, and do not properly develop specific IgE against it. In other words, the body recognizes pollen as a foreign particle, but does not see it as a threat and produces no antibodies against it. As allergic rhinitis is nothing more than an allergic reaction of the nasal cavity, people with other diseases of allergic origin, such as asthma, eczema, allergic conjunctivitis, urticaria, etc. are at increased risk of allergic rhinitis. Symptoms of allergic rhinitis include sneezing, runny nose, nasal stuffiness, tearing and itching of the eyes, nose, and palate (the roof of the mouth). The occurrence of sinusitis is also frequent, characterizing a picture of rhinosinusitis (rhinitis + sinusitis). Other common symptoms are sore throat, hoarseness, coughing and decreased taste and smell. Two typical signs of allergic rhinitis are the accentuation of the lower eyelid lines (a sign called Dennie-Morgan lines) and the darkening of the skin below the eyes, like a look. The picture below illustrates these two signs well. Allergic rhinitis in some people may be seasonal, occurring only at certain times of the year. However, many patients have an almost constant picture of allergic rhinitis, such as numerous episodes throughout the year. These are usually those who are exposed to allergens constantly, whether at home or at work. If the patient lives in an environment where he or she is frequently exposed to the allergen, the tendency is for the symptoms to get worse and worse and a smaller amount of allergen will be able to trigger the seizures. Some people become so sensitive that other factors can trigger rhinitis, such as exposure to cold, smoke, or strong smell. In addition to symptom control, treatment of allergic rhinitis should always aim at reducing exposure to allergens triggering seizures. If the allergen is unknown, there are allergy skin tests that can identify you. a) Saline solution : flushing the nostrils with saline or other saline solutions is efficient to eliminate the allergens adhered to the nasal mucosa in those milder cases. Washing can be done several times a day and can be used to cleanse the cavity before other drug applications. b) Nasal Decongestants : For many years nasal decongestants have been the most popular drugs in the treatment of rhinitis. The most commonly used substances are pseudoephedrine, phenylephrine and oxymetazoline. These drugs cause a constriction of the nasal vessels, decreasing secretion of mucus and relieving symptoms. However, these nasal sprays should NOT be used for more than three days in a row, as they often cause addiction, causing the nose to become clogged again unless the decongestants are re-used repeatedly. This dependency is hard to reverse. c) Antihistamines: Since histamine is the substance that causes the symptoms of allergic rhinitis, antihistamine drugs can be used for treatment. However, antihistamines, despite improving sneezing, itching, and coryza, are not as effective against nasal congestion as a normally needed decongestant. It is very common in the market to associate a nasal solution that combines an antihistamine and a decongestant. Antihistamines may also be taken as tablets, but they usually cause some drowsiness. The most common are: Loratadine, desloratadine, cetirizine, levocetirizine, diphenhydramine, clemastine and fexofenadine. d) Nasal corticosteroids : Nasal corticosteroids are currently the first-line drug in the treatment of allergic rhinitis. There are several options on the market: fluticasone, mometasone, budesonide, flunisolide, triamcinolone and beclomethasone. They are all similarly effective. Patients with very severe nasal congestion sometimes need to use nasal decongestants and antihistamines for a day or two before starting the corticosteroid so that it is more effective. Nasal corticosteroids are effective in the treatment and prevention of allergic rhinitis and can be used even outside seizures. Unlike systemic corticosteroids, nasal corticosteroids are safe drugs that can be used for many years. It is only advised that patients who are using nasal corticosteroids for prolonged periods have their nasal cavity examined by an otorhinolaryngologist periodically to avoid the rare complications, such as mucosal lesions and infections. e) Immunotherapy : also called "vaccines", immunotherapy is a treatment that aims to desensitize the patient to allergens. It consists of injecting small doses of the allergen so as to accustom the body to the same, reducing the response to its exposure. Immunotherapy currently exists only for the most common allergens, such as pollen, mites, animal hair, etc. The treatment lasts for a few years and should not be discontinued at the risk of loss of efficacy.